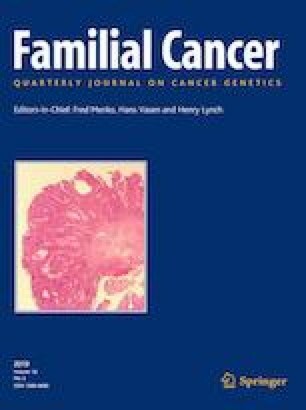 Many colorectal cancers (CRCs) that exhibit microsatellite instability (MSI) are not explained by MLH1 promoter methylation or germline mutations in mismatch repair (MMR) genes, which cause Lynch syndrome (LS). Instead, these Lynch-like syndrome (LLS) patients have somatic mutations in MMR genes. However, many of these patients are young and have relatives with cancer, suggesting a hereditary entity. We performed germline sequence analysis in LLS patients and determined their tumor’s mutational profiles using FFPE DNA. Six hundred and fifty-four consecutive CRC patients were screened for suspected LS using MSI and absence of MLH1 methylation. Suspected LS cases were exome sequenced to identify germline and somatic mutations. Single nucleotide variants were used to characterize mutational signatures. We identified 23 suspected LS cases. Germline sequence analysis of 16 available samples identified five cases with LS mutations and 11 cases without LS mutations, LLS. Most LLS tumors had a combination of somatic MMR gene mutation and loss of heterozygosity. LLS patients were relatively young and had excess first-degree relatives with cancer. Four of the 11 LLS patients had rare likely pathogenic variants in genes that maintain genome integrity. Moreover, tumors from this group had a distinct mutational signature compared to tumors from LLS patients lacking germline mutations in these genes. In summary, more than a third of the LLS patients studied had germline mutations in genes that maintain genome integrity and their tumors had a distinct mutational signature. The possibility of hereditary factors in LLS warrants further studies so counseling can be properly informed. The results published here are in whole or part based upon data generated by The Cancer Genome Atlas managed by the NCI and NHGRI. Information about TCGA can be found at http://cancergenome.nih.gov. The online version of this article ( https://doi.org/10.1007/s10689-019-00128-6) contains supplementary material, which is available to authorized users. RMX, NAE, and XL designed and supervised the overall project, analyzed and interpreted the data, and drafted the manuscript. They take full responsibility for the integrity of the data and the accuracy of the data analysis. RMX, TC, JA, PM, and MR processed, prepared and analyzed samples. JRC enrolled patients and acquired data. RMX performed the statistical analysis. RE, and VA revised and selected all pathology specimens. FL and JC supervised the genomic analysis. SSK critically revised the manuscript for important intellectual content.The study sponsors had no role in the design of the study; no role in the collection, analysis, or interpretation of the data; no role in the writing of the manuscript; and no role in the decision to submit the manuscript for publication. This work was supported by grants from the American Cancer Society Illinois Division (Grant No. 223187, X.L. ), the National Cancer Institute (Grant Nos. U01 CA153060 and P30 CA023074, N.A.E. and 1K01CA204431-01A1 R.M.X.) and the Prevent Cancer Foundation (RMX). The content is solely the responsibility of the authors and does not necessarily represent the official views of the National Institutes of Health. None of the authors have any potential conflicts of interest to disclose that are relevant to the manuscript.